Get Well Fast. Stay Healthy Affordably. We connect users and their most important health and sensor data to the newest most affordable care solutions. MyHealth.Us provides members with secure emergency medical profiles and five-digit LifeCode IDs. They can access and share their medical records, track health conditions and get better healthcare solutions. The result is fewer medical errors, earlier treatment, lower costs, higher ROI and employee loyalty. Access MyHealth.Us 24/7 for urgent care, diagnosis, treatment, and preventive services. MyHealth.Us 24/7 assists members to secure their records, track their health and obtain better healthcare. Organizations empowering employees with LifeCodes report up to 15% decrease in claims and overall 19% cost savings, higher ROI, and lower employee absenteeism and higher retention and satisfaction. Giving employees control of their data, ability to collect and store observations, and access to better and faster care helps everyone win. Annual Service Included. Add Company Logo. "We have had zero complaints, and we see more opportunities to use them beyond cost control and emergency assistance. We’ll be rolling them out to more associations soon." "I am a very active 74 year old. I love to work in my garden but because I have severe arthritis my kids are afraid I may fall and hurt myself. In case of an emergency my children know they will be called immediately because I make it a priority to wear my QR Life Saving Code where I store all of their numbers." Get Well. Stay Healthy. More Affordably. 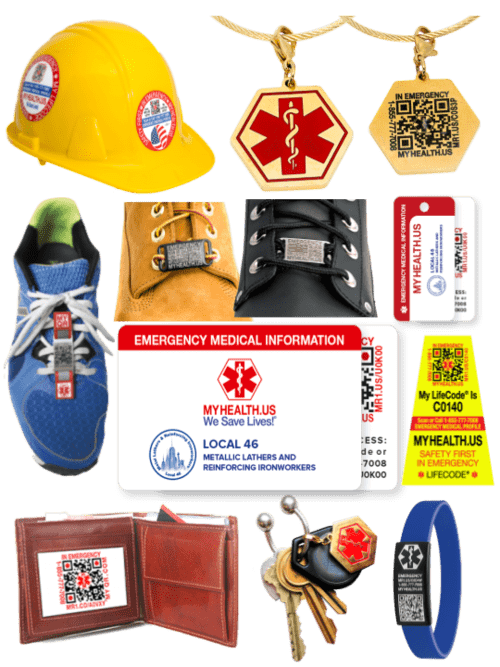 Founded in 2013, MyHealth.Us provides 24/7 secure storage and controlled access of your Emergency Contacts, Personal Details, Medical Images and Records. Our patent-pending Health Diary, Photo Journal, Reminders and Doctor Notes create the most vital and current data required for getting better treatment faster and more affordably. MyHealth connects you to the best independent sites and services online and locally for appointments, second opinions, medications, lab tests, telemedicine, and much, much more. In emergencies, during treatment and for preventive care, we save lives with better health information and faster access to the medical care you need.